Our LDFJ Crawler Mobile Impact Crusher is designed to crush quarry rock or recyclable materials such as concrete, granite, limestone etc. The diesel engine as well as heavy-duty tracks are standard with this model. Full remote control movement and operation allows your wheel loader or excavator operator to move and operate the impact crusher from the comfort of their loader. Other key features includes a unique, wireless remote control lifting liddesign that allows for blockage clearance during operation. The wireless remote control triggers the lifting lid allowing over sized material to pass through the crusher without stoppage. 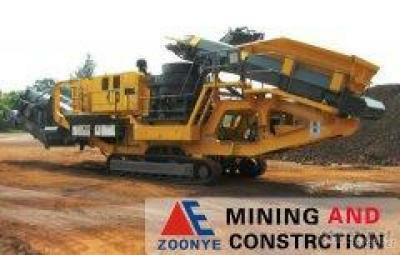 The sophisticated design of the Impact Crusher generates high production with low maintenance costs.